Polls are open until the end of the day Tuesday, May 12. Enjoy! Hard to say if Chrono Trigger is actually my fave out of the 64 in this contest... but I have no qualms if it wins it all either. Great game. Same goes for FF VI as well, actually. What a memorable game. 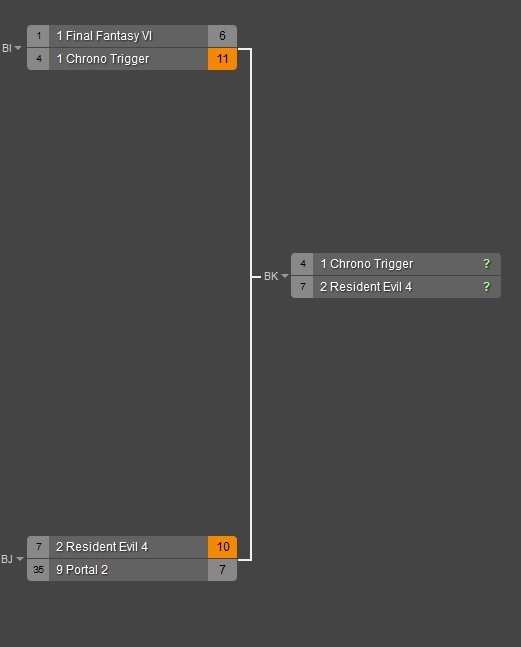 #1 was a veryyyyyyyyyy tough one for me, but Resident Evil is one of my favorite games ever so there you go. Third place, not so tough. Don't have quite the same love for FF VI as some do. Hm, this is pretty tough. Both CT and RE4 are my second and third favorite 3rd-party games. But in which order? Portal 2 got beat down???? You people are the worst. THE WORST. These are some close races! These are all really good games!